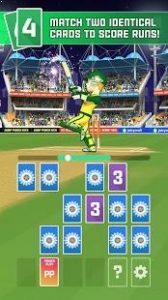 T20 Card Cricket : Hit runs and score tons in this memory-matching game with an exciting cricket twist! Match identical cards to score runs and avoid HOWZAT cards as you bat through 270 challenges and become the greatest batsman OF ALL TIME! Randomised card decks ensure no two games play the same. Win or lose, every run you score increases your XP level. Level up your character to earn special ability cards. Create your personalised character and try to achieve the legendary ranking! Track your career stats on your character profile card; Highest score, total runs, hundreds, fifties, average, not outs and ducks! Rewarded video ads! Watch a short video ad and receive a free random special card. Improves your memory and concentration! I love cricket and I love this. Great fun, easy to play memory game. Really enjoying the challenges! Love the mini games. The character animations are so smooth. Overall a great game! Superb game for cricket lovers. A format of playing which we used to play using playing cards when we were young. Good controls and graphics stand out.